Recruiting Millennials, Gen Z Survey: 73 Percent Plan to Offer Student Loan Assistance | Challenger, Gray & Christmas, Inc. In mid-May, rapper Nicki Minaj made headlines, not for her music, but for paying off several of her fans’ student loan debt. Beyonce and Chance the Rapper have also pledged funds to help students. A new survey released Thursday by global out placement and executive coaching firm Challenger, Gray & Christmas, Inc. shows celebrities are not the only ones noticing the amount of student debt; employers are, as well. According to the Challenger survey, nearly 73 percent of employers plan to offer student loan assistance to attract and recruit young talent. The survey was conducted in May among 100 human resource executives from US-based companies of various sizes in a number of industries. “While celebrity action is helpful on a small scale, it is nowhere near enough to shift the tide on the $1.3 trillion dollars of student loan debt in the United States. Student loan debt is the second highest consumer debt in the country, with over 44 million borrowers,” said Andrew Challenger, vice president of Challenger, Gray & Christmas, Inc.
“With the average student loan borrower from the class of 2016 facing about $37,172 in debt according to Forbes, - and those with advanced degrees likely have much higher debt - it’s no wonder employers have begun to see this as an opportunity to recruit young workers,” said Challenger. According to the Challenger survey, 33 percent of companies reported their workforce is currently comprised of between 26 and 50 percent of millennial workers. Seventy-eight percent of employers are targeting millennial workers in their recruitment efforts, and another 56 percent are actively trying to attract Gen Z workers. 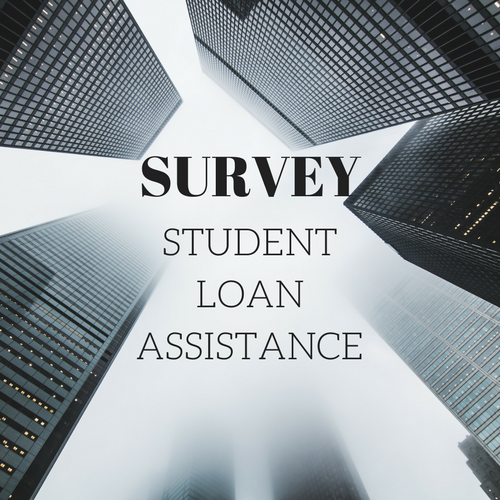 While many companies report they are targeting young talent, and 72.5 percent report they plan to implement student loan assistance as a benefit, the Challenger survey found very few companies are actually offering student loan assistance currently. Twenty-two percent of companies currently offer this benefit. “It’s likely we’ll see an increase in this kind of offering from companies, especially as companies in industries like tech and financial services continue to see labor shortages,” said Challenger. Of those that plan to implement student loan assistance, only 14 percent plan to do so soon, while the remaining 58.5 have no definite timeline for implementation. Another 27.5 percent do not plan to offer the benefit and are not targeting younger workers. A 2015 Allstate/National Journal Heartland Monitor poll found 30 percent of workers who self-report as “just starting out” rank paying off student loan debt as their biggest financial challenge. This is compared to 10 percent of workers who reported student loans as their biggest challenge who are older and more established. 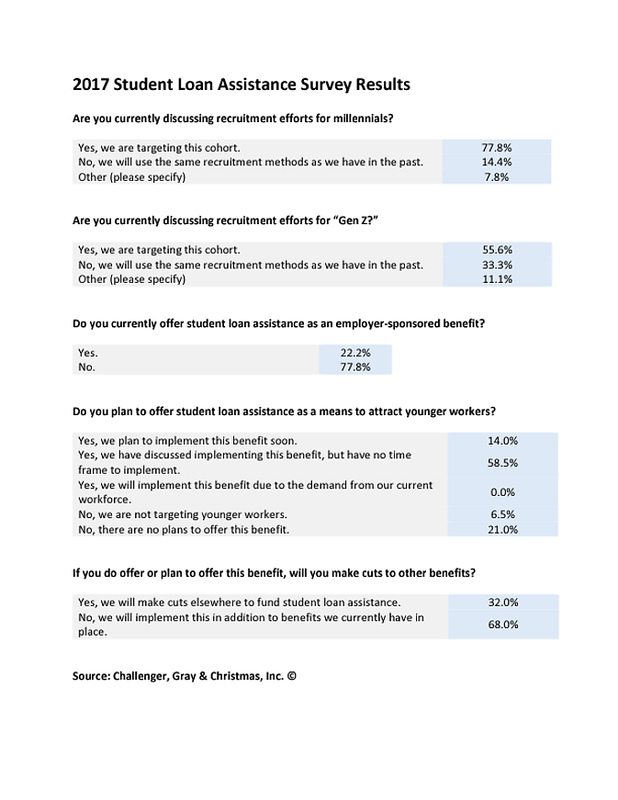 Moreover, a 2015 American Student Assistance Survey found that 76 percent of respondents reported that if a prospective employer offered a student loan repayment benefit, it would be a deciding or contributing factor to accepting the job. “Paying off student debts opens up other financial opportunities for millennials and the upcoming Gen Z workforce. Major milestones, like starting a family or buying a house, typically depend on whether these workers can pay off student loans. “Companies who offer student loan assistance will undoubtedly catch the interest of younger talent,” said Challenger.